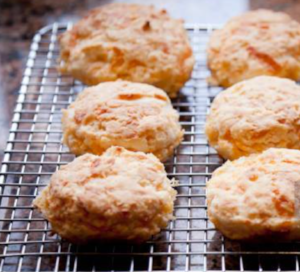 Biscuits are normally carb and fat bombs—these have less than half the calories and carbs. And you also get cancer-fighting cruciferous veggies in this one. If you can’t find white whole wheat flour, do a 50-50 mix of all purpose flour and whole wheat flour. Preheat the oven to 400 degrees. Mist a baking sheet with nonstick cooking spray. In a large bowl, whisk together the flour, salt and baking powder. Add the oil, milk and the Blend and mix well to combine. Drop heaping tablespoons of batter onto the baking sheet, leaving several inches in between. Top each biscuit with ½ tablespoon of the Parmesan and bake for about 15 minutes, until biscuits are golden brown around the edges. Serve warm.